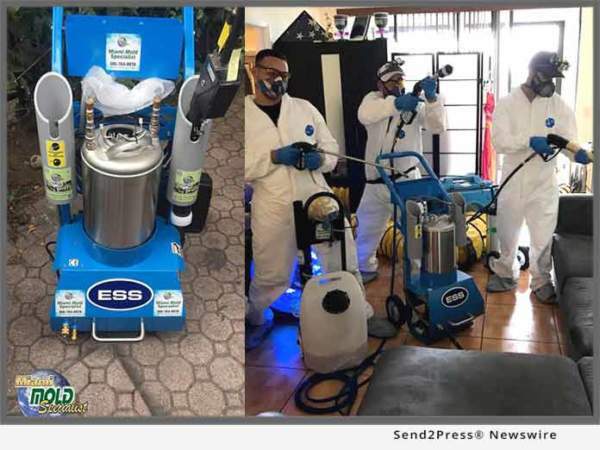 MIAMI, Fla. /Florida Newswire/ — Eco-friendly mold inspection, mold removal, and indoor environmental service provider in South Florida, Miami Mold Specialists, continues to enhance service offerings, updates HVAC mold removal protocols with new line of high tech equipment. In Florida, HVAC systems work a tremendous amount of overtime and require a substantial amount of maintenance. HVAC systems are in fact, a vital system for maintaining not only a comfortable living environment, but more so, as a preventative measure for maintaining a healthy living environment. Most inhabitants of South Florida understand this, but most do not understand that HVAC systems are also one of the biggest bacteria breeding grounds in a home or building, which can distribute bacteria, pollutants, particles, allergens, mold, smoke; exacerbating the potential for sickness and severe health conditions. A spokesperson for Miami Mold Specialists stated, “Miami Mold Specialists prides itself on staying on top of all industry updates. We are constantly researching and testing the latest and greatest systems, solutions, and technology as to give our clients the best, long lasting, outcome possible with our services. As such, to combat unsanitary and mold infested HVAC systems and respective duct work, our state certified technicians use the newest state of the art exclusive carry all ULV Particle Fogger system, which combats even the smallest of particles found in hard to reach areas, such as; central A/C units, vents, attics and crawlspaces. Miami’s Premier Indoor Air Quality, Mold Remediation Service Provider- Miami Mold Specialist: High Tech and Eco-Friendly Indoor Air Quality, Mold Inspection, Mold Testing, and Mold Removal Services.